Okay, so I write for an Oregon Ducks sports blog, so what? I’m biased, that much is obvious, but there’s actual evidence that supports the title of this piece. Now that college football has finally moved to a playoff to determine a champion, the door has been opened for more teams to prove they can hang with the best, or in other words, the SEC. Before last year, the last time a BCS National Championship game was held without at least one SEC team participating in it was exactly never. Oregon participated in a historic event last season…an SEC-less BCS Title Game. That’s right, since its inaugural game on January 8, 2007, the BCS National Championship game had always featured at least one SEC team competing for the title. Now granted, this was probably warranted. SEC teams have been historically dominant, especially when one considers that Florida State’s 2014 National Championship victory broke a streak of seven consecutive SEC victories. But, in the first year of the playoff, everything went up in smoke. In a traditional BCS year, Florida State , the undefeated reigning champion, would’ve squared off against Alabama, the No. 1 seed in the country and the SEC champions. Oregon would’ve played (and likely lost to) Ohio State in the Rose Bowl as a consolation prize, and more likely than not Alabama would’ve restored balance in the world by beating Florida State and reclaiming the National Title in the name of the glorious SEC. But it wasn’t a traditional BCS year, it was a playoff. 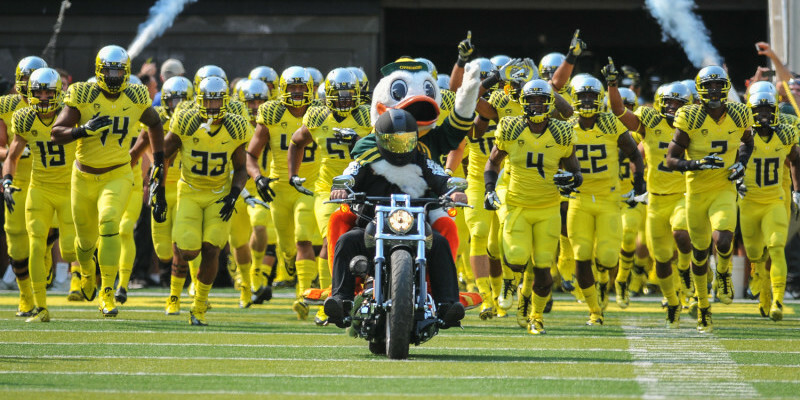 Oregon dismantled the reigning champs in embarrassing fashion and Ohio State … well, Duck fans you know the rest. The two teams that would’ve duked it out for intergalactic champions of the universe, or in other words the title known as college football’s finest, were ousted in the semifinals. Now see, this is why I love sports, and in particular college football. Murphy’s Law states that anything that can go wrong, will go wrong. The College Football Law, or CFL for short, states that anything that should happen, won’t happen™. 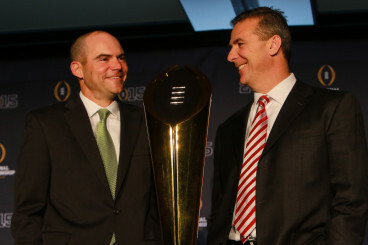 How else can one explain Ohio State’s impossible rise to stardom? How can a team lose two starting quarterbacks and still beat three of the top ten teams in the country back-to-back-to-back? It’s inexplicable, but that’s why we as fans keep coming back. Cardale Jones is the only starting QB from last year’s final four to return, and even he won’t likely start. Fast forward to this year, and already the college football world is up in flames before a single snap has been played. Exactly none of last year’s four playoff teams return their starting quarterback (granted Ohio State could if they wanted to, they just likely won’t). So, ignoring the behemoth that is the Ohio State team, there are likely three new spots to fill. This is the part of the article where I actually start to justify my title, so for those who stuck around this long I commend you. The team to beat will still be, until further notice, Ohio State. BUT, and here’s where things get interesting, the Pac-12, not the SEC, will be the conference to beat come playoff time. Now here’s why. It means that *gulp* there might come a time in the near future when none of the top four teams contending for intergalactic dominance comes from the SEC! The SEC was regarded as the conference of champions coming into bowl season and yet only two of the seven teams ranked in the top 25 could pull out a victory. So not only is the SEC finally being recognized as overrated, but teams enter this year in one of the conference’s weakest conditions ever. Can you imagine it? A world without the SEC fighting to be the top dog? It feels like bad luck to even dream about it. But of course what would ESPN do? Would they have to shut down? 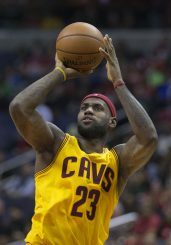 Could LeBron decide to finally enroll in college and join the Alabama football program, giving the NCAA no choice but to allow Alabama into the playoff? These are real questions, people. Back to seriousness for a minute, though, no SEC team in the final four is a very real possibility. Albeit unlikely, if there were ever a year where the SEC ended up beating itself and keeping each other out of the playoff, this would be the year. The SEC will be as hyper-competitive as always, but unlike years in the past there is no clear-cut winner. And, I promise, this isn’t just me saying this. For the first time in the SEC poll‘s 23-year history, the SEC-related media predicted separate divisional and conference champions. Voters predicted Alabama would win the SEC West, but that Auburn would win the SEC entirely. Now here’s where it gets tricky: Auburn is also a member of the SEC West. It doesn’t even make sense! A team can’t finish second in a division and also win an entire conference. That’s how confused people are about the state of the SEC this year. Meanwhile, the Big Ten is clearly a two-horse race between Ohio State and Michigan State, as is the Big 12 between Baylor and TCU. The ACC will be mostly irrelevant now that the Seminoles are Jameis-less. Of the power five conferences, the Pac-12 is all that’s left. Oregon and USC are my early favorites to win their respective divisions, and considering they play each other right before the season’s end, the two could basically have a warm-up game for the Pac-12 Championship. Say Oregon and USC split the two games but win out against everyone else. Both would emerge as dominant one-loss teams, with their only losses being to each other. It’s possible that the committee would slide them in as the three and four seeds, completely leaving out the SEC and ACC, whose best teams could have two losses. Now again, this a crazy hypothetical. The SEC will likely have a stand-out by the season’s end who will secure one of the four spots. That’s what should happen. But what do they say about college football again? Anything that should happen, won’t happen.